The measles virus is among the most infectious of all known viruses, with an attack rate of well over 90%. That means that over 90% of susceptible people — those who have not been vaccinated or who have not had the disease — will get it if exposed. I’ve seen one case, and that was thirty years ago, although my parents showed me a picture of what I looked like with measles in 1958. It was like the picture above. Before the introduction of a vaccine in 1963 measles caused about 4 million cases annually in the USA, leading to 48,000 hospitalizations and 500 deaths. That’s a lot of kids in the hospital and a significant mortality. 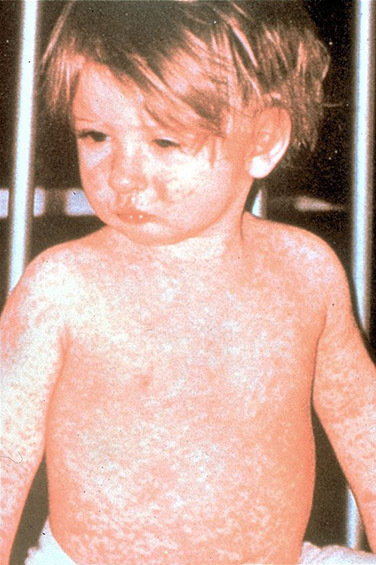 The measles vaccine has nearly eliminated these things, but not entirely. I recently ran across an interesting article from a couple of years ago that investigated a measles mini-epidemic that happened in Southern California. One thing that caught my eye, something I had not considered before, was the economic cost of the epidemic. The outbreak happened when an unvaccinated seven-year-old child returned from Europe after being exposed to measles there, and proceeded to expose other children. Like many viruses, people who are infected shed virus before they know they are sick; think of it as a crafty strategy the virus uses to spread itself. Although 879 people were exposed, most of these were vaccinated so only 12 secondary cases occurred, all in unvaccinated children. Nine of these children were deliberately unvaccinated, but three of them were too young to have received the vaccine. One three-month-old had to be hospitalized. Forty-eight children too young to be vaccinated had to be quarantined at home for several days. The authors estimated the economic costs of the entire epidemic, including lost work time for parents, costs of treatment, and time spent by the health department investigating it, at nearly eleven thousand dollars per case. So besides saving lives, measles vaccine reduces healthcare costs significantly.